Learn how different methods to measure willingness to pay compare. Read how validity and reliability can affect the quality of your surveys and the data you collect. Sample size in surveys has an impact on estimate precision and level of confidence in the results. Learn how. Learn about the challenges research clients are facing from research we did for the American Marketing Association (AMA). Conjoint Analysis allows us to conduct more realistic price research. Consider it whenever possible. 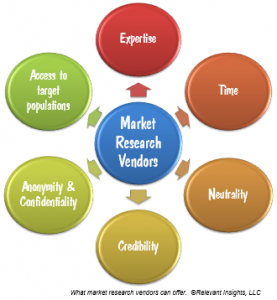 When Do You Need A Market Research Vendor? Should your company hire a market research vendor or handle all market research with internal resources? Sometimes a external research vendor is your best bet. Adding cell phones to telephone samples is a challenging task. Read more what to consider.